For anyone wondering: our tadpoles who turned into frogs most likely jumped out of our bowls and onto the grass and most likely are living a fabulous froggy life. Either that or they shriveled up and died and we just can't see them anymore because the water has become so darn murky. 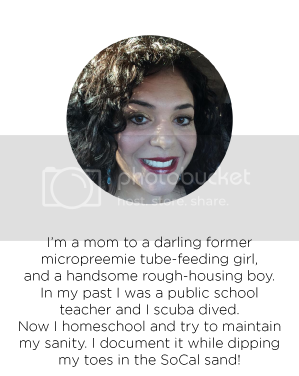 Darn it...I'm raising two children and homeschooling and am going to start working in my hubby's business soon...I don't have time to be raising tadpoles! Anyway...Tiny B had an amazing IEP (Individual Education Plan) meeting and an even more amazing orthopedics appointment today and my heart is full. She's worked so hard. Today I told her that she doesn't understand it now, but someday she wlll understand just how much of a miracle she is. 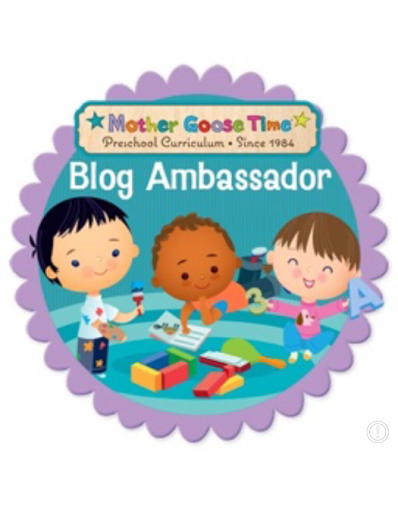 Both Tiny B has been very insistant that we do every Mother Goose Time pond theme activity. 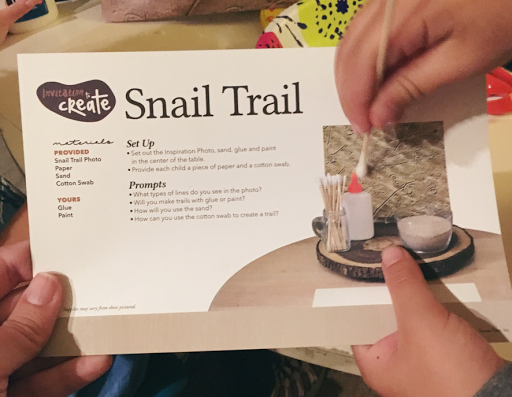 I had the Snail Trail Invitation to Create sitting on the homeschool table for about three days and it seemed that she was asking to do it nearly every hour! I finally obliged even though it was the evening and I was tired. 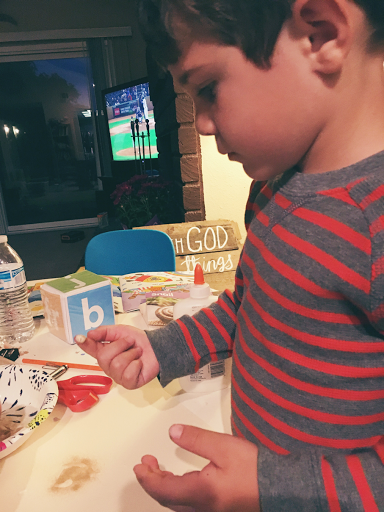 Strong B's face simply slays me. It is the sweetest. Tonight I was going through photos and found a side profile picture of me. The resemblance is striking. 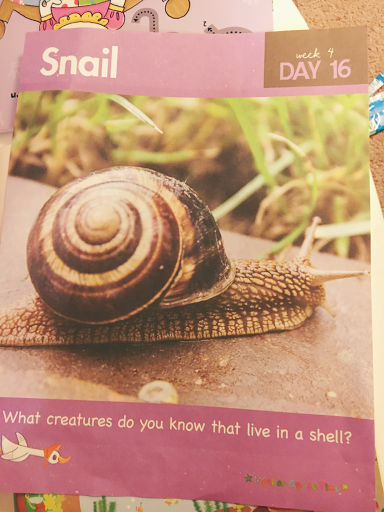 We opened up our Snail activity bag for Day 16. The recent change Invitation to Create (MGT used include a lot of product based art and it has changed to about 50 percent process based) has caused me to become much less stressed during art. There is absolutely no pressure for them to produce a perfect project. I can sit back, talk with them, and really just observe how they choose to engage with the materials and what end product they want to produce. 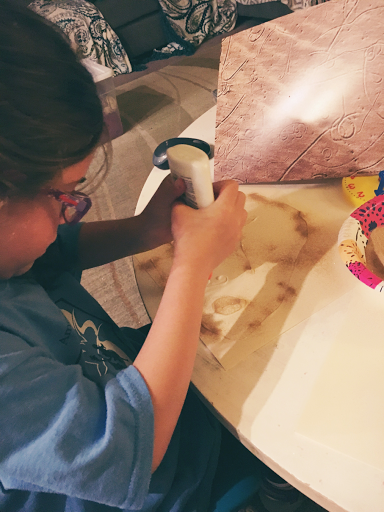 He decided to spread the sand with his finger and she used her fingers and glue. 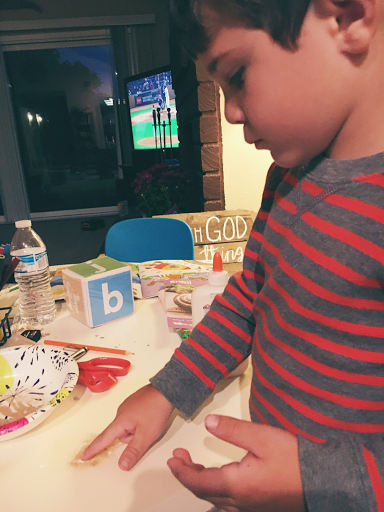 He then used glue as well, and probably decided on that when liked the look of his sister's work. 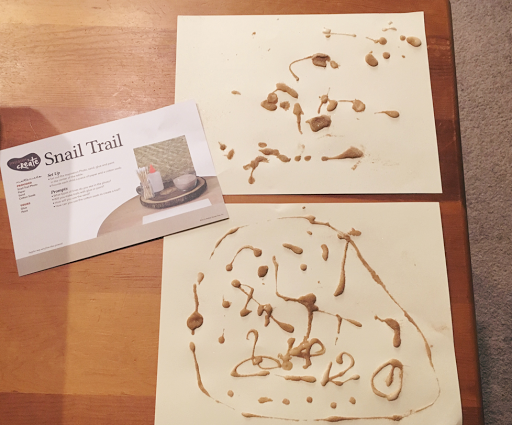 We discussed the reason why snails have trails and got into some other snail facts. We will be starting the Bugs and Crawly Things MGT unit tomorrow. My cue was when I saw Strong B catch a ladybug and they both fought over it all day. We took out the manipulatives for the month and looked through the Teacher Guide and talked about all the fun we will have in (amidst all of the packing for our new adventure).